Are They Really Different From Us? When we speak of an enlightened being, just who is that being? This is not a simple question. If the confluence of attributes we identify as "me" have no self-essence, who is the being that is enlightened? It may be that an enlightened being knows all and sees all. But if we were to be enlightened, would this enlightened being be the same person who brushes our teeth and wears our socks? Read More: Self, No-Self, What's a Self? 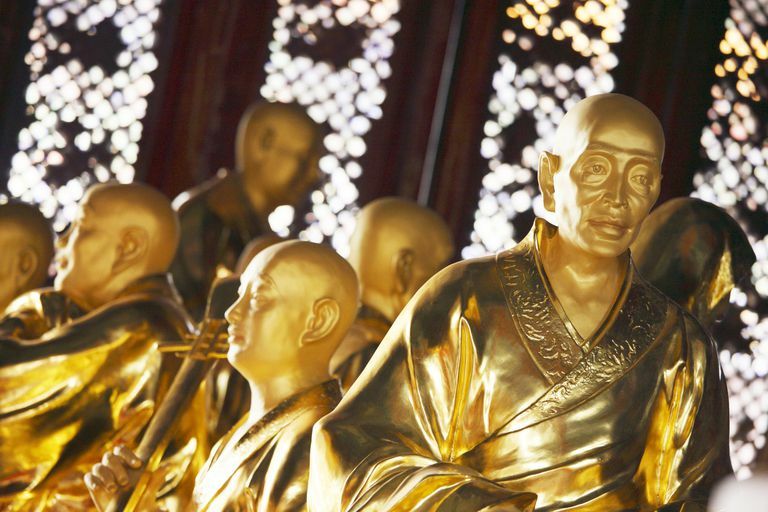 Read More: What Is Enlightenment, and How Do You Know When You've "Got" It? In Theravada Buddhism, the two classifications of enlightened being one runs into most frequently are buddhas and arahants (or, in Sanskrit, arhats; "worthy"). Both buddhas and arahants have obtained discerning wisdom; both are purified of defilements; both have obtained Nirvana. The term bodhisattva, "enlightenment being," generally is associated with Mahayana Buddhism and will be discussed at greater length below. But bodhisattvas appear here and there in the Pali scriptures of Theravada Buddhism. A bodhisattva might be a person of great spiritual attainment but not yet a buddha, or a person who might become a buddha in a future life. But this still doesn't quite answer the question of "who is the being that is enlightened"? In the Pali scriptures the Buddha was clear that the body is not the self, nor is there a "self" that inhabits the body or the attributes of the Skandhas. An enlightened being may be free of sickness, old age and death, but the physical body even of the Buddha succumbed to these things. As a student of Mahayana I hesitate to explain the Theravada understanding of "enlightened being," because I suspect this is a subtle teaching that requires time to perceive, and it may be that only the enlightened perceive it. But this leads us into the Mahayana view. Especially in Mahayana, when we speak of enlightened beings, we must take care how we understand this. The Diamond Sutra in particular is full of admonishments about claims of and attachments to individual enlightenment, attributes or merits. Possession of attributes is an illusion, it says. "Enlightened being" is just a designation that cannot be claimed by any one being. The bodhisattva ideal of Mahayana is the enlightened individual who vows to not enter Nirvana until all beings are enlightened. My understanding is that this is not about altruism but the fact that, as Mahayana understands it, that's now enlightenment works. Enlightenment is the essential nature of all beings; "individual enlightenment" is an oxymoron. Commentaries on the Diamond often point to the Trikaya, the three bodies of Buddha, and remind us that the Truth Body, the dharmakaya, displays no distinguishing attributes. The dharmakaya is all beings, undistinguished and unmanifested, so in the dharmakaya we can't separate anyone out and call him special. My understanding is that when we speak of an enlightened being, we are not talking about a physical individual who possesses some special attribute. It's more about a manifestation of the enlightenment that is what we all are. Realizing enlightenment is not a matter of acquiring something new but revealing what was always present, even if you weren't aware of it. But if we're talking about the body that eats and sleeps and wears socks, we're talking about the nirmanakaya body. My understanding from Zen teaching is that, enlightened or not, this nirmanakaya body is still subject to cause and effect, and still subject to physical limitations. Of course, the three bodies are not really separate, so the "enlightened being" neither is nor is not an individual said to be enlightened. I realize this explanation may be confusing. The important point -- and I cannot emphasize this enough -- is that within Buddhism a teacher who assertively advertises himself as enlightened -- especially "fully enlightened" -- is to be regarded with great suspicion. If anything, the more realized the teacher, the less likely he or she will make claims about his own spiritual accomplishments. Claims that an allegedly enlightened being has undergone some sort of bodily transformation ought to be regarded with several large grains of salt. Several years ago an American teacher in a Tibetan lineage tested positive for the AIDS virus but remained sexually active, thinking that his enlightened body would transform the virus into something harmless. Well, he died of AIDS, but not before infecting other people. Apparently he never explored the question who is the being that is enlightened deeply enough.